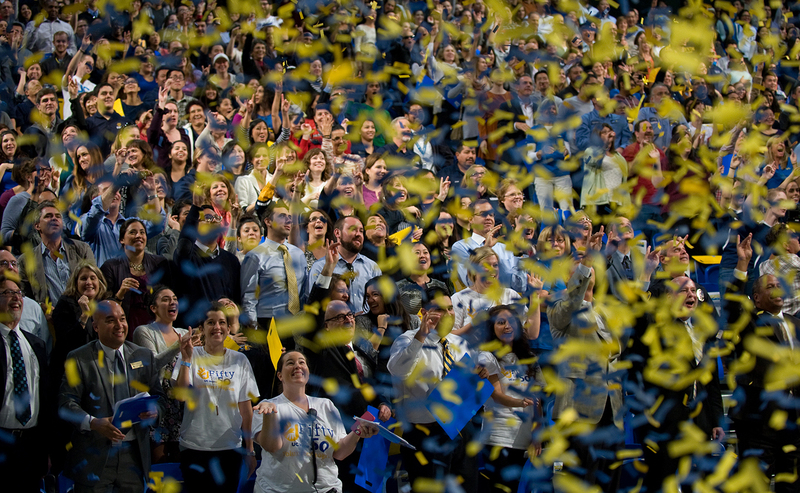 Confetti rains down on the crowd at UCI’s Fifty for 50 Volunteer Program launch December 4 at the Bren Events Center. Chancellor Howard Gillman led more than 800 people at the Bren Events Center on December 4 for the 50th Anniversary Anteater Spirit Rally, which launched UCI’s Fifty for 50 Volunteer Program. The campaign encourages members of the UCI community to personally donate 50 service hours during the university’s two-year anniversary period concluding in June 2016. After hearing Chancellor Gillman’s remarks and participating in a commemorative aerial photo to spell out “UCI 50,” more than 700 volunteers came together for the annual stocking-stuffing party sponsored by UCI Staff Assembly. Volunteers filled 988 stockings with toys, snacks and personal care products for children benefitted by the Olive Crest organization, nearly doubling their initial goal.